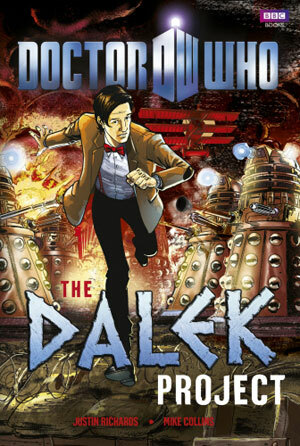 Originally intended as a 10th Doctor graphic novel which would have come out a couple of years ago, this story has been completely redrawn to feature Matt Smith’s incarnation of the Time Lord. It’s an interesting tale, and you can see why it was pulled initially – there are certain elements which are similar in tone and concept to Victory of the Daleks. The script pulls the story along at a breakneck speed, which suits the 11th Doctor perhaps better than his predecessor, with a 21st century framing sequence hinting at the horrors of 100 years earlier – which we then get to see. The Daleks (the proper ones, not the new paradigm version) are as devious as ever we’ve seen them on screen – or indeed in the comics. There’s a definite feel of the old Countdown strips from the 1970s to this tale, and the scale of the plotting feels like the TV21 incarnations. Mike Collins’ art is occasionally variable – there a few close ups of Matt Smith which really don’t feel right – but some of the splash pages are stunning, and there are some terrific new Dalek variants to reflect the twists and turns of the story. As Justin Richards points out in our interview with him , there are some deft and subtle nods to Victory; these acknowledge the plotline convergence without rubbing the reader’s face in them.